A Chugger Pump is often an essential piece of brewing equipment that holds a special place in many avid homebrewer’s hearts. In its simplest form, it is used to transfer hot and cold liquids between brewing vessels. Over time, however, many homebrewers have encountered what seems to be the common issue of a noisy Chugger Pump. All it takes is a simple Google search, and you will easily find a plethora of articles, videos, and forum posts where homebrewers are complaining of the issue and attempting to solve it. Typically it begins with the pump vibrating, then the vibrations quickly escalate into a loud, grinding or screeching noise until finally, the pump stops moving liquid entirely. This well-documented problem has even been mentioned in Brew Your Own magazine, when Chugger released its newest pump (Chugger X-Dry Pump) that was actually marketed against the noisy problem. Identifying the Problem: What IS that noise?! For many years, homebrewers have been blaming this painful screeching sound on cavitation, which is defined as the formation of an empty space (in a solid object) or bubbles (in a liquid), typically by the movement of a propeller through it. Cavitation occurs when air is introduced into the pump head and impellers. When a pump cavitates, the paddle inside is basically free-wheeling and the RPM’s rise sharply, which makes the distinct whining/grinding noise mentioned previously. Of course, a pump is never silent, and there is indeed a “normal” pump sound that can be heard any time the pump is running, but the noise we’re referring to here is a very sharp, distinct sound. But Wait…Is The Chugger Actually Cavitating? With over 30 years of experience in the HVAC industry, Kenny has witnessed his share of cavitation in various types of pumps and circulators. In these instances, motors would actually speed up because it was free-wheeling in the air without any resistance or back pressure. However, we began to notice with the Chugger Pump that when it emitted the sound, the pump motor was actually slowing down (and in some cases, coming to a complete stop), which clued us into the fact that cavitation may not be the culprit. 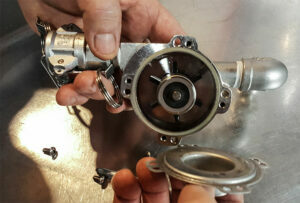 The lack of liquid in the pump causes the impeller to speed up, as there is very little resistance (i.e. cavitation). However, when liquid is present, the pump should act it’s nominal speed. Therefore, when the Chugger begins to vibrate and make the dreaded noise we’ve been referring to throughout this article, this is indicative of mechanical resistance, not cavitation. Kenny’s first thought (after coming to the conclusion that it was not cavitation causing this noise) was that the impeller was possibly binding on the shaft of the pump. 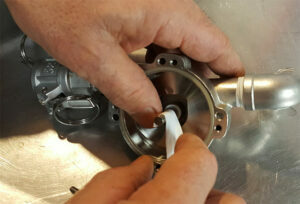 From there, he began to disassemble the Chugger Pump, removing the screws on the outside cover, the screws on the inside cover, and then finally removing the actual impeller from the shaft to inspect it more closely. Upon initial inspection, which included manually spinning the impellers, he realized that he could re-create the same noise. The impeller was actually bouncing on the shaft as it turned, causing deflection. After thinking we’d figured out the problem (the noise being caused by the impeller binding on the shaft), Kenny attempted to lubricate the impeller shaft with a few drops of olive oil. While this solution did work to an extent while running the pump dry, the results were not sustained when hot liquid was reintroduced, and the terrible noise returned just minutes after the oil had washed away. Therefore, while in some ways proving our initial hypothesis that the issue was deflection and not cavitation, we still had to go back to the drawing board for a solution. The next discovery we made was an important one. When testing the pump with liquids of different temperatures and viscosities, we quickly realized that the noise would occur at a much greater rate when extremely hot (180 degree +) water was used. We believed that since water has a low viscosity and therefore lubrication ability, the higher temperatures were causing the potential for the noise. This belief was furthered when we noted that the problem occurred more frequently with plain hot water versus wort, which has a higher viscosity due to the dissolved sugars and other elements present. Having a higher viscosity than water, we noticed that wort produced the noise far less frequently when compared with plain water, as the hot water provided insufficient lubrication to the impeller riding on the stainless steel shaft. With our new knowledge that both temperature and viscosity affected the frequency of the noise coming from the pump, we disassembled the Chugger Pump once again and searched for something to put on the shaft to mitigate the deflection at these extremely high temperatures. Coincidentally, there was a roll of 3/4” Teflon tape nearby. After trimming a small piece (approximately 1 1/4” – 1 1/2” in length) and wrapping it around the shaft in a clockwise direction (about 1.5 times around), we slowly fit the impeller back onto the shaft (also in a clockwise direction to ensure the Teflon tape didn’t pull). After reassembling the Chugger Pump and turning it on, we were happy to hear it running both smoothly and quietly! But we were not out of the woods yet – the real test would be under brew conditions with extremely hot water. We fired up the hot liquor tank, cranked it to 200 degrees, and tested the newly repaired pump. To our delight, the pump ran smoothly and quietly! As it turned out, the solution for the problem of a noisy Chugger Pump was, in fact, fairly simple. Creating a lubricating cushion or bearing surface between the shaft and impeller was the key to solving the problem that has been irritating brewers (including ourselves) all over the world for years! Simpy wrap the outside diameter of the impeller 1.5 times with Teflon tape, slide the impeller over the Teflon tape (in the same clockwise direction) and voila! You’ve got yourself a quiet, functioning Chugger Pump! One thing we would suggest though is to change the Teflon tape each time you open up the pump for sanitation reasons – approximately every 5-6 brews. This will ensure your brew days from here on out are as smooth and quiet as can be! This entry was posted on Wednesday, January 23rd, 2019 at 7:07 pm	and is filed under Product Support. You can follow any responses to this entry through the RSS 2.0 feed. You can leave a response, or trackback from your own site.